The Kuskokwim 300 Sled Dog race has a new champion and a new record. The hard, fast trail combined with good weather, and some of the sport’s top teams made for a competitive cluster at the front of the pack. It was still totally dark, save a bright full moon, at 7:02 a.m. Sunday morning when Matthew Failor arrived at the finish line with 11 dogs in harness. The 36-year-old, who mushes out of Willow, has run the race twice before, including last year, but this is his first time winning it. “Last year was great. This is the same group, same group from last year, and they’re a fantastic, wonderful, intelligent group of dogs,” said Failor. Failor now holds the fastest win in the race’s 40-year history. At a total elapsed time of 36 hours and 32 minutes, the run beats Martin Buser’s old record from 25 years ago: 37 hours and 4 minutes in 1994. Because Failor split his six hours of mandatory rest in two three-hour chunks in each Kalskag stop, he had well-rested dogs for the final 100 miles. His team was peaking at the right stage: after posting the fastest run time of the field, Failor moved to the front of the pack on the run into Tuluksak and held his lead through the final 50 miles into Bethel. Even still, Failor’s win was slim. Three other mushers arrived at the finish line just over 20 minutes later. Nicolas Petit pulled in less than two minutes after Failor. Immediately on arriving, Petit told the race marshal that he’d gone off course. He had been racing with his headlamp off and went down Church Slough, shaving a mile-and-a-half off the trail. After a review, the race judges levied a one-hour penalty on Petit, knocking him back to fourth place. 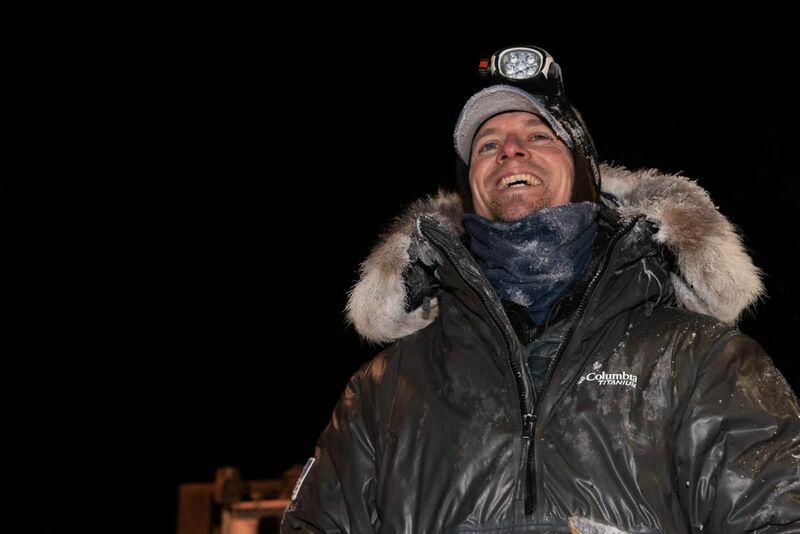 Petit congratulated Failor, but the misstep was reminiscent of his 2018 Iditarod run, when he lost his lead after straying from the trail during a ground storm. Petit was self-effacing about his misfortune. Though Petit had just six dogs when he arrived, they were energetic and boisterous, looking ready to keep running. Defending four-time champion Pete Kaiser finished in second place after Petit received his penalty. After lagging a bit in the first part of the race, Kaiser leap-frogged past several mushers during the second half. “We had a good last 150 miles. Might have sandbagged a little too much at the beginning, but that gave us some extra power at the end. That was our gamble and it didn’t work out perfectly, but still happy with our finish,” said Kaiser. Kaiser and other race veterans said that the trail conditions were good, relative to recent years, though there were reports of moose holes and rough patches in some areas upriver. Temperatures hovered around zero, comparatively mild for the K300. Still, even a good trail along the Kuskokwim means ice. Third-place finisher Jessie Holmes tipped his sled on the way inbound, spending the last 50 miles kicking through pain. Holmes, too, says that he lost some time from a deviation off the trail heading into Bethel. In fifth place was past K300 champion Jeff King, followed not long after by last year’s Iditarod winner Joar Leifseth Ulsom. Matthew Failor’s victory brings with it $25,000 from a total race purse of $160,000. Note: this story has been updated to reflect the race’s ruling on Nicolas Petit. From KYUK Public Media, and used with permission.